When Deiber Segura Cascante was born in 1992 his father, Juan Ramón Segura was the head guide at Hacienda Barú National Wildlife. His fondest memories of his early years were of his walks with his father on the nature trails of the refuge. What he remembers most about those walks are the birds his father found and pointed out to him. 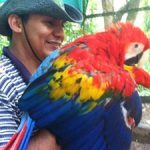 Ever since he can remember he has loved tropical nature and has dreamed of being a guide like Juan. Though Deiber has great interest and enthusiasm for birds and many other aspects of nature, he has a special interest in botany. When he was attending the local high school in the village of Matapalo he became fascinated with the nitrogen cycle and also the manner in which plants convert carbon dioxide into plant fiber and release oxygen in the process. Of all his experiences in the jungle the one that made the most profound impression on Deiber was a confrontation with a collard peccary. He had seen many of these wild pigs during the years he had traversed the rainforest, but none had shown the slightest sign of aggressiveness. One day in the highland rainforest of Hacienda Barú he encountered a small herd of peccary blocking the trail. One animal walked out of the herd and came toward him at a brisk trot shaking its head, clacking its teeth together and squealing. Deiber didn’t know whether he should stand his ground, turn and run, or climb a tree. He said he felt like he was in a bull ring with a furious fighting bull. After a few moments the herd moved off the trail and dispersed into the jungle and the aggressive peccary turned and hurried to catch up. From this experience Deiber learned that animals are similar to humans in that they are individuals, each with its own personality. Just because most peccaries are gentle animals doesn’t mean that there aren’t a few hot heads. Deiber acquired an appreciation for birds and a talent for their detection and identification from a young age. To supplement his knowledge he took a short-course on avifauna with the foremost ornithologist in Costa Rica. 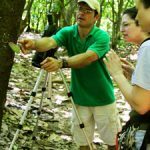 He has been guiding ecological tourists and birders through the diverse habitats of Hacienda Barú National Wildlife Refuge since he graduated from high school.